No refunds will be given on the day of the event. For cancellations within two weeks of the event a refund is possible, if the place can be filled, less a £5 administration fee. No refund can be given if the space cannot be filled within two weeks of the event. For cancellations more than two weeks before the event, a refund will be given, less a £5 administration fee. MGM Training highly recommended as very knowledgeable about yoga practice which made it very relevant to teachers. The workshop taught by Edgar Stringer and Lydia Holmes received excellent feedback from participants: the teachers were 'fantastic' and their teaching superb, detailed and challenging with the benefit of having one teacher help while the other taught. Other comments were that it was a great venue and lovely atmosphere, there was lots to absorb and perfect for a November Sunday! Participants with a wide range of experience and ability benefited greatly from Uday's in depth teaching. His thorough approach and his instructions to 'do it again' were always said encouragingly and with humour. Participating in a day long workshop can be challenging, so after the break most were grateful for the restorative poses and focus on the breath. We look forward to welcoming Uday back again (and again!). Participants enjoyed another well-paced training day with Garry Harvey of E-magination Training; his quirky sense of humour is like the spoonful of sugar that helps the medicine go down. Thank you to everyone who participated in Lynda Purvis's full day intermediate level workshop with us in Esher. It was an all-women affair, mainly teachers and trainees, and feedback was very positive praising Lynda's teaching, overall atmosphere, venue and location. One satisfied attendee's email sums up the day very well. "Thank you for organising the workshop. I loved it. Just right for an intermediate workshop....so as strenuous as it should be. I would have brought more props like another mat and bolsters if I’d thought about it. Well done, we love Lynda’s teaching". SWLSIY are now planning our next full day intermediate level workshop for Autumn 2018, so watch this space! Jayne's wisdom and years of experience shone in her lively and energised teaching. She skillfully brought a new perspective to those poses well known to participants and linked them to the more challenging ones, making it accessible to all abilities. The AGM was well attended, including by some new SWLSIY members. Afterwards attendees were treated with the delights of a free workshop with visiting teacher Lin Craddock, Senior Intermediate level 3 teacher from Maidstone. Lin's sincere warmth, wisdom, knowledge and dedication to her subject shone through in her in depth teaching, accessible to all abilities. First Aid Training Day, with Garry Harvey of E-magination (formerly Silver Cloud Academy), Saturday 25 March 2017, 10 am - 4 pm, St Christopher's Church, Hinchley Wood, Surrey. Bookings open to non-SWLSIY members on 25th January. General workshop with Annie Rossi - Saturday 4 February 2017, 10.30 am - 4 pm, The Bhavan, West Kensington. Annie taught an inspiring workshop to an enthusiastic group of 21 participants. By demonstrating the links between the asanas, Annie enabled students to gain a better understanding of familiar poses and laid the foundation for our attempts at more challenging poses. Annie also shared some yoga philosophy; by drawing on the Yoga Sutras, she explained how the values and tenets recorded at the time of Patanjali are relevant to our practice today. Participants were further treated to a musical interlude, courtesy of Sanjai Sankar on tabla and Giorgio Curcetti who played the oud. Set in an Indian cultural centre - with the sounds and sights of music and dance - together with Annie's wonderful teaching, made it a very special day. National Iyengar Yoga Day Saturday 14 January 2017. On Saturday 14 January the second annual National Iyengar Yoga Day (NIYD) took place in the UK and Ireland to celebrate the teachings of Guruji, B.K.S. Iyengar, and to promote the Iyengar yoga nationally. Events included free taster classes and celebrations of Guruji's life in centres throughout the country. Whatever the activities to mark the day in South West London and Surrey, SWLSIY would be interested in any photos of the day, including simple class photos, so that we can share these with IY UK and among our members and social media. Students worked for three hours with an intensity and precision few achieve when left to their own devices; their efforts leavened by Penny’s wit and humour. Huge gratitude to Penny for her generosity with her time and knowledge. SWLSIY were very grateful to Sallie Sullivan who kindly stepped in at short notice to run the day. Sallie, a senior teacher based in Sussex, also an assessment moderator and teacher trainer, delivered a very productive training day focusing on adjustments for inversions and variations and adjustments for back bends, followed by Pranayama. A positive coming together of dedicated yoga enthusiasts, the annual meeting was well attended with over 25 members, including the committee. The afternoon also comprised of a challenging workshop taught by senior teacher, Sophie Carrington, followed by an informal social gathering with refreshments. Uday Bhosale taught an inspiring and energising two-day workshop at the Bhavan, attended by over forty participants. Uday's attention to detail, humour and strong teaching skills helped students gain greater depth and understanding in the asanas, whatever their level and experience. Garry Harvey from Silver Cloud delivered a hands on and informative first aid training day; for many teachers this was a refresher course. Garry's wealth and years of experience as a paramedic and teacher, together with his energy and wit made the training a very positive experience. A truly inclusive workshop which was accessible to all levels, delivered with humour, encouragement and a depth of knowledge that comes from such a long standing commitment and dedication to Iyengar yoga. Brilliant! Thanks too to the SWLSIY team who made the day possible. P Boylan. Following the PD Day Julie delivered a successful morning workshop, open to all students. In December 2014, 21 June was declared International Day of Yoga by the UN General Assembly. The first celebration of the International Day of Yoga this year was observed by millions worldwide. Over 35,000 people, including Indian Prime Minister Narendra Modi, and dignitaries from 84 nations, performed 21 asanas for 35 minutes at Rajpath in New Delhi. The Iyengar Yoga Assocation (IYA) organised events in Exeter, during the annual convention over the weekend. Throughout the UK events were organised by centres and individuals of which Iyengar yoga had a significant presence. In South West London The Bharatiya Vidhya Bhavan hosted a free open day on Sunday 21st involving the resident yoga teachers (who include SWLSIY Iyengar teachers) and students. It proved very successful with well over a hundred visitors, embracing Patantali's yoga and all yoga practices, including Iyengar. A representative from the Indian High Commission was the guest speaker of the event which opened in the Mountbatten Hall with talks and asana demonstrations, followed by popular taster classes throughout the day, of which the High Commission representative himself was a student! SWLSIY ran a successful stall with Iyengar yoga demonstrations. A big thank you to everyone who helped support the event. SWLSIY were delighted to welcome Jacky from Manchester and District Iyengar Yoga back to South West London. She led a beautiful and inspiring workshop, with references to Dharana (concentration) and Patanjali's Yoga Sutras. It was also an opportunity to join others and members of the SWLSIY committee for the AGM and an open forum on the future of Iyengar Yoga in South West London. 22 participants attended the workshop in the Bhavan's spacious, bright gallery which Suzanne and John tailored to students new to workshops as well as those with experience. Professional Development Day for teachers - 8 November 2014, IY Yoga Studio, Tooting. Teachers benefited from a constructive and inspiring day, sharing knowledge under the guidance and wisdom of moderator and senior teacher Brenda Booth from Kent. A most successful weekend attended by 35 students with excellent teaching of Barabara Novell, Kiran Chothe and John Shirbon. Set in the characterful manor house of Oxon Hoath, with beautiful views of the gardens and surrounding Kent countryside, the weekend included restorative classes on Friday evening, Pranayama classes on both mornings and both general and intermediate classes to accommodate all levels. John also taught an introductory Pranayama class. Home cooked vegetarian food, much of the produce supplied from the walled garden within the grounds, as well as live piano performed by residents, made it all the more memorable and special! SWLSIY AGM and workshop with Barbara Novell - Sunday 6 April 2014, 1pm-5pm, IY Yoga Studio, Tooting. “Have your say” session and SWLSIY AGM, followed by a workshop (free for SWLSIY members) with Barbara, a very experienced and popular teacher who has been to Pune regularly over the years. As well as enjoying top class yoga, participants had the opportunity to hear about SWLSIY's plans from its committee members as well as contribute ideas. Jacky Taylor gained her Intermediate Junior level 3 teaching certificate in March 2010. She is currently the Chair of Manchester and District Iyengar Yoga (MDIY) Executive Committee. Jacky teaches and continues to study at the MDIY. Kiran has studied at theRamamani Iyengar Memorial Yoga Institute (RIMYI) in Pune, India since 1991, that being the city of his birth. He has been living and teaching in Budapest for the last 5 years and we are pleased to welcome him to teach for our Institute following his relocation to London. He holds an Intermediate Junior - Level 3 certificate. SWLSIY Workshop with Julie Hodges - Sun 13th January 2013, 10.00am to 1.00pm. Julie has over 25 years experience of teaching Iyengar Yoga. She is a highly respected Senior teacher and has her own Iyengar Yoga Centre in Putney South West London. Julie is also a Teacher Trainer and an Assessor for IY UK. The opportunity to practice, learn and challenge yourself deeply in the Asanas through Julie's style of teaching is one not to be missed... a must for serious practitioners! For full details click here. SWLSIY Workshop with Jayne Orton - Sat 10th & Sun 11th November 2012, 10.30am to 4.00pm. Jayne is the director of Iyengar Yoga Birmingham. She started practising Iyengar Yoga in 1975 and has been visting India regularly to study with B.K.S Iyengar, his son Prashant and daughter Geeta since 1982. She was awarded a senior level certificate in 2000 and is the central region's most experienced teacher of the Iyengar method. In 2011 she became one of a very select group of Senior teachers to be a give a special Advanced certificate by the Master himself. Jayne taught a hugely popular day as part of the inaugural celebrations for SWLSIY in May 2012. We were delighted and honoured to welcome her back. For more information on this workshop click here. SWLSIY Workshop with Uday Bhosale - Sat 21st & Sun 22nd July 2012, 10.30am to 4.00pm. Uday has been a disciple of yoga at the Ramamani Iyengar Memorial Yoga Institute (RIMYI) in Pune for the past 12 years and has been teaching there since 2001. At RIMYI he teaches the children’s classes as well as beginners and medical classes. He also has a wealth of experience teaching elsewhere - children, industrialists, doctors, sportspersons, corporate workshops and has taught an intensive at the Iyengar Yoga Centre of Singapore. For more information on this workshop click here. What better way to drive this message home than SWLSIY's workshop with Judith Richards in April this year? We gathered for a civilised 10am start in a sunny and airy hall in Long Ditton, sat on our mats and waited for what was in store - and it was a treat. We spent the morning deconstructing and reconstructing back-bends - which I think I should now call back extensions. The deconstruction involved an analogy of the structure of a back extension. Judith compared the spine to bricks cemented in place to build an archway. 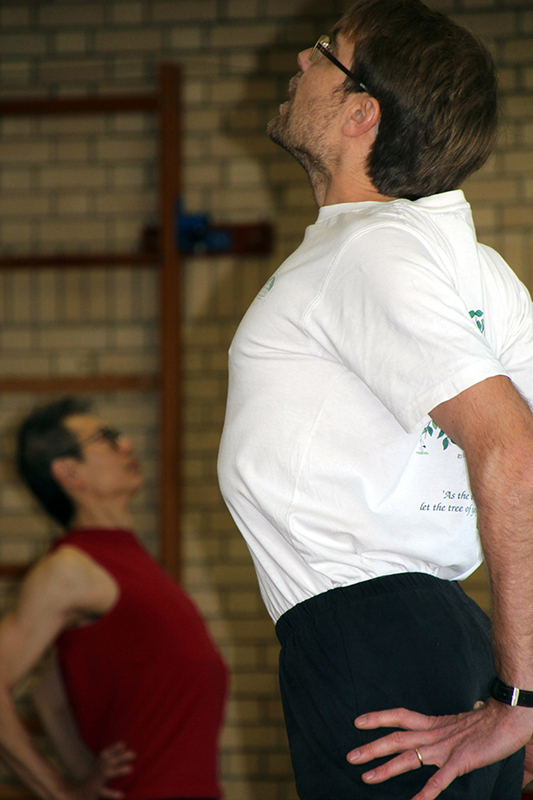 As we paid attention to each vertebra being held in place, the spine therefore being strengthened, rather than just dropping back, we were able to go deeper into the poses, appreciating the extension and the strength in equal measure. I remember well the first time I realised that backbends involved hard work for the front thighs - and this workshop held a similar surprise as we focused on the back of the thighs extending up to meet the paraspinal muscles. Judith also gave a beautiful analogy as we extended our spines, quoting Geetaji, of the “sternum as a leg for the head”. Starting with uttanasana, followed by parsvottanasana, we progressed through to ustrasana and a fair few invigorating urdhva danurasana's before a break for lunch. When we resumed Judith took a good look around the room and clearly thought that we still had a lot more work to do before our spines were strong enough to sit for pranayama. She let us off the hook and we enjoyed two hours more of restorative poses and pranayama - supine! The whole day was a treat and we were very lucky to receive individual attention and expert tuition. A very big thank you to Judith from us all. SWLSIY's most senior teacher, Judith Richards, first started practising yoga in the Iyengar method in 1970 and started teaching in 1976. Judith finds that learning yoga is a lifelong process and brings to her teaching a wealth of knowledge and experience balanced with humour and warmth. Our AGM took place on the same day. We were delighted to have secured Margaret Austin, one of the most popular senior Iyengar teachers in the north of England, for a workshop in Thames Ditton, Surrey. Margaret has been teaching Iyengar yoga since the late 1970's and regularly travels to Pune to study with the Iyengar family. For more information on this workshop, click here. We were pleased to welcome Brenda Booth, senior Iyengar teacher in Kent, for a workshop in Tooting, SW London. Brenda has amazing depth of knowledge of the postures, remedial work, sequencing and the philosophy of yoga, making her classes fun and challenging. For full details, click here.